Take these steps to keep your career on track while you get your business degree. In an ideal, world, everyone who goes to grad school would quit their jobs and focus on achieving that advanced degree full-time. No distractions from life—or more specifically, from work. But for most people, quitting a job to go back to school just isn’t an option financially— especially for those who are already buried in undergraduate student loan debt. In addition to the financial investment, “if you leave your job to get your MBA, you could be losing opportunities for professional advancement,” says Julie Cohen, leadership coach and CEO of Work Life Leader. Even if you’re fortunate enough to work for an employer that will cover all or at least part of the tuition costs, working full time while going to school can be draining both physically and mentally, which could take a toll on your work performance. Follow these tips to keep your career on course while getting your MBA. Before you take on the heavy course load of an MBA, you’re going to need to get your manager’s support. Meet with your boss to discuss your plans before you begin the program. Once you’ve conveyed that getting your MBA will be a win-win for both you and the company, you can ask about flexible work arrangements like being able to work remotely one day a week while you’re on campus. “Employers understand the commitment of time, energy, and attention that’s required of MBA students,” Cohen says. Translation: If you’re good at what you do, your boss will help you create an arrangement that works for the both of you. Once you start the MBA program, you’ll need to take steps to maintain open communication with your manager. One way Cohen says you can do this is by having quarterly meetings with your boss where you share knowledge and discuss how you’re growing as a professional. In addition to getting the boss’s buy-in, you’ll want support from your colleagues. After all, they may be the ones taking on extra work when it’s crunch time for you. Let your peers know in advance about blackout dates, like final exam periods, so they’ll be prepared ahead of time. “Co-workers are usually very accommodating if they know your circumstances in advance,” says Pittsburgh-based career coach Chris Posti. Balancing work and school will require solid time-management skills, Cohen says. An easy way to better manage your time is to get the syllabus for each course you’re going to take and compare class deadlines, such as papers, midterms, and final exams, to work deadlines and business meetings, and then plan your schedule accordingly. Above all, be sure to time block for study hours, so you don’t find yourself doing schoolwork during the workday, as Posti says, could be grounds for termination. Depending on your work style, an online MBA program might be a better fit than a traditional, on-campus program. From a flexibility perspective, Jamie Klein, founder of Inspire Human Resources, a New York-based HR consulting firm, says online programs “enable you to tackle the workload on your own schedule.”. 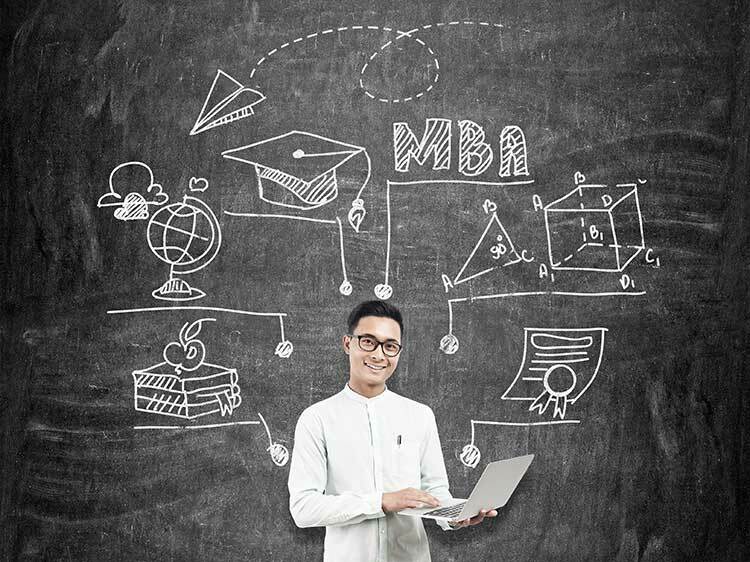 Granted, if you simply don’t have the ability to take classes in person because you’re on a strict 9-to-5 work schedule, an online MBA program is a viable option. When you start an MBA program, you’re immediately adding significant work to your plate. No matter how good you are at managing your time, you might have to make some short-term sacrifices. This might entail something as simple as watching less Netflix or checking Instagram less frequently, or something more substantial, such as temporarily scaling back on volunteer work in your spare time. That being said, Cohen says it’s important that you don’t sacrifice self-care, such as diet, sleep, or exercise. It won’t be easy balancing a job while getting your MBA, but in the end, it will totally be worth it. With an MBA in hand, you’ll find yourself highly sought after by companies—yes, even your dream companies—as you apply to some of the best jobs in the business world. The juggling act you're currently starring in is impressive, but you will—believe it or not—eventually graduate and have that MBA. Then you're on to act two. Could you use some help getting a job with that freshly minted MBA? Join Monster today. As a member, you can upload up to five resumes—each tailored to the types of jobs that interest you. Recruiters search Monster every day looking to fill top jobs that require an MBA with qualified candidates, just like you. You worked hard to get this far, let Monster pick up some slack!